Arc Aroma Pure develops a system, which has the potential to substantially improve efficiency of biogas production and reduce greenhouse gas emissions. Through the optimization of biogas production, more energy can be extracted from the organic material. However, let´s start to answer a few questions: What is biogas, how is it produced and why will greenhouse gas emissions be reduced using the Arc Aroma pure technology? In a biogas plant this natural process is utilized. In this process, a material such as sewage sludge, manure, agricultural crops and food waste is placed or pumped into a digester, which is a completely airtight container. In some cases, pretreatment necessary for reception, pumping, mixing and degradation to function optimally. The gas in the digestion chamber is normally saturated with water vapor. In addition to the biogas, a nutritious digestate is formed, which can be used as a fertilizing agent. The anaerobic digestion process can be divided into three main stages; hydrolysis, fermentation and methane production. In the first step, complex organic compounds are decomposed into smaller compounds such as sugar and amino acids by microorganisms and enzymes . The second step is fermentation. During fermentation, a large a number of intermediate products are formed, including alcohols, fatty acids and hydrogen gas. In the last step of the digestion process, methane gas is formed by an unique group of microorganisms. What makes Arc Aroma Pure a cleantech / greentech company? Arc Aroma Pure develops a pretreatment facility that enables optimization of biogas production. In most biogas substrates, a major part of the nutrients are encapsulated (=hidden), which means that the digestion process is not optimally auto catalyzed. Thus, the digestion process will be slow. CEPT® acts directly at the cellular level and smashes structures which results in a faster fermentation process and a higher yield of released gas(es). Furthermore, there is an unmet need from biogas manufacturers to use new substrates. A breakdown of the raw material at the cellular level opens the possibility of using new raw materials that have not previously been considered suitable for biogas production. In addition, there is further potential to use technology as a cool and energy efficient alternative to heat-based sanitation (cleaning of raw material for biogas production). The company’s main focus in the current situation is the efficiency of biogas production. What is CEPT? CEPT is Closed Environment PEF Treatment. PEF is the abbreviation for Pulsed Electric Fields (PEF) or electroporation, a technique that is routinely used, for example, in the introduction of new genetic materials into cells. The Arc Aroma Pure system is pre-installed in container modules to facilitate an easy connection to the customers´curent production lines (!). In the fall of 2009, Arc Aroma Pure signed an agreement with a leading energy group on a jointly funded feasibility study. In 2010, the collaboration was extended and the Arc Aroma Pure technology was verified both in lab scale and process scale. The parties agreed that the technology can be used as a substitute for heat-based pasteurization. Laboratory experiments also showed that the technique can radically streamline the production. A higher gas yield was observed. The concept behind the CEPT is based on electroporation, a proven technology, used today in micro and molecular biology. It is a continuous process that act directly on cells and structures by short, pulsed electric field creates pores in the cell membrane and cell walls. This leads to the death of microorganisms and nutrients from different types of raw materials are released and become more readily available for digestion. The result is faster fermentation and a higher gas exchange. Depending on the substrate composition in the substrate, the Arc Aroma Pure CEPT® pre-treatment improves the methane production yield by 15–50 % (!). Additionally, the fermentation rate is increased allowing for the higher yield to be produced in shorter time than without a CEPT pre-treatment. This fact allows for the hold time in the reactor to be reduced allowing the plant to convert larger amounts of raw material to gas in the same timeframe. The target markets are biogas producers, technical consulting companies, wastewater treatment plants, universities and scientists plus a host of applications for other target markets. In 2014 there will be a global launch of the CEPT starting in the Nordics. Other identified and creative applications of Arc Aroma Pure clean technology – In ballast water treatment. Ballast water treatment today is heavily discussed today, primarily due to that marine ecosystem are being mixed up. Alien marine species have been found in areas where they do not belong, which has led to disruptions including the fishing industries. This is a global concern. IMO classifies the above problem as fourth biggest threat of the oceans. This led to the convention “Control and Management of Ships’ Ballast Water Sediments” adopted in 2004. The Convention phases in purification methods (as required) with the start of the smaller boats in 2009. CEPT® treatment involves a biological treatment of pumpable products and therefore it can be used with great benefits as it is both energy efficient and also more environmentally friendly than alternative methods. This is due to that the purification occurs without heating of the water or addition of chemicals. In addition to the biogas application, the board believes that the CEPT® platform,will add value as an energy efficient alternative to biological treatment of liquid products. Heat is traditionally used in the purification / sanitizing processes, for example within water and liquid food. In this context, the process is called pasteurization. Pasteurization is a generic term for various techniques in which food is heated to a certain temperature for a certain time. This is performed with the aim to kill harmful bacteria and microorganisms. The CEPT® platform can perform this without heating, and this is called cold pasteurization. Cold pasteurization has great advantages over conventional pasteurization because the treated product is not affected in respect to either taste or texture. For example, CEPT® treated juice tastes just like freshly squeezed juice. Also protein-rich foods are interesting candidates for CEPT® treatment, as these can not be heat treated because proteins denature and solidify when exposed to heat. CEPT® technology ca also be applied in the purification of water. Contrary to heat based pasteurization, heat resistant effectively kill heat resistant microorganisms. Furthermore, cold pasteurization is significantly more energy efficient and cost effective in comparison to heat-based pasteurization. The supply of clean water is a growing problem in many parts of the world. The consequence is an increasing demand for environmentally friendly and cost effective water purification methodologies. Here, CEPT® could play a decisive role in the future as it is both environmentally friendly and cost effective. Why? The Arc Aroma pure technology is both energy efficient and avoids addition of chemicals. This is in contrast to the majority of water treatment options available on the market today. Arc Aroma Pure holds approximately 27 percent of the shares in another company, namely OptiFreeze AB. Pär Henriksson (CEO and director of Arc Aroma Pure) is the CEO of Optifreeze and Anders Hättmark is a Optifreeze director (and also a board member of Arc Aroma Pure). OptiFreeze and the link to the Arc Aroma Pure technology could be summarized with the following points: Patent pending freeze technology that allows fruits and vegetables to retain their flavor and shape even after thawing. OptiFreeze AB apply the Arc Aroma Pure technique in its pre-treatment facilities and is thus dependent on the Arc Aroma Pure’s technology. When fruits and vegetables are thawed after freezing, crystals grow so fast that the cell structure collapses. By controlling the fluid inside and outside the cells, the cell structures are safeguarded. The technique is based on the application of vacuum technology along with PEF treatment. The treatment enables cell survival, which in turn leads to that the food flavor, texture and quality will be maintained throughout the freezing and thawing process! Arc Aroma Pure’s CEO Per Henriksson very recently presented the company´s technology at “Gasdagarna” (October 22 to 23 in Båstad, Sweden). Gasdagarna was organized by the industry association Energy Gas Sweden. The event is aimed at companies and organizations in the field of energy gases, where biogas is an important part. The company also had a booth and presented the CEPT product. “The invitation was a result of the interest in the technology among biogas producers. Our presence in Gasdagarna will be an important step as we now entering a market, ” said Pär Henriksson, CEO, inventor and founder of Arc Aroma Pure. Arc Aroma Pure’s patent strategy is focusing on the generator construction design and its synchronization, and the treatment chamber to ensure a stable environment. The generator consists of several modules that are optically synchronized, these are constructed from available simple components. The treatment chamber is designed as a positive pump, which ensures a stable environment. This solution is scalable and can be customized as needed. Included in the patent is also a description of the method and a number of listed applications and substrates. Arc Aroma Pure intends to apply for additional patents in the event that the Board determines that the Company’s intellectual property protection can be further strengthened. A protected trademark (403,502) for CEPT® is also granted. The patents and the trademark is owned by Arc Aroma Pure. 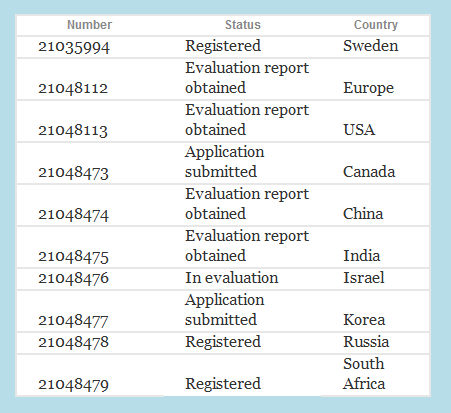 However, recently it seems that a Isreal- ,Chinese-, European- and US- patent has been approved. Arc Aroma Pure and Nordic Water Products AB has for some months been performing pilot attempt at a wastewater treatment plant, where the two companies’ technologies are combined in order to see if we can achieve a heightened effect. The trials have been successful and full-scale test will therefore start in spring 2014 and last for about six months. The full-scale test is designed to verify the synergistic effects observed in the pilot tests. Currently, Arc Aroma Pure believes that the results may be published only after the full-scale test ended. If the results of the full-scale test is positive, the companies intend to enter an agreement which will state that Nordic Water Products AB will market and sell the combined technologies globally, through subsidiaries and distributors. Arc Aroma Pure’s CEPT® platform will then be included as a component in the combined technique. Nordic Water Products AB develops and markets mechanical and engineering products and technologies for the treatment of water and wastewater to municipal and industrial customers worldwide. “We are very pleased that we have now reached the point where we can start full-scale tests. If the tests turn out well, we have a partner with a solid reputation in the global market. Nordic Water is an innovative company with several exciting products on the market. Working with a company such as Nordic Water, gives us credibility and access to a very extensive global marketing and distribution network, ” says Pär Henriksson, President of Arc Aroma Pure AB. “Nordic Water sees great potential in the combined techniques with many applications in our segment wastewater. We are actively seeking new innovative Swedish technology and Arc Aroma Pure suits us well because the company represents innovation and curiosity,” says Göran Arnkil, Partner, Nordic Water Products AB. Arc Aroma Pure AB looks forward to working with BroGas, not least because the BroGas biogas plant is very well maintained and possesses great skills. Arc Aroma Pure will, in cooperation with BroGas, further develop the company CEPT® platform. Meanwhile BroGas strive to increase the efficiency of biogas production. Together the companies will evaluate and analyze CEPT®-platform benefits of biogas production. It is also part of the agreement that BroGas will assist and participate in the visits and views for future customers and stakeholders. The plant will therefore be an important future demo site. In parallel, Arc Aroma Pure will own the right to use the built-in function for remote access to enable viewing of a facility in operation at the continued marketing. As compensation, BroGas has been offered a discounted price if the companies choose to implement a commercial business. Normally, the Arc Aroma Pure pricing is based on a payback period of less than 36 months, which corresponds to the value generated by the pretreatment with CEPT® platform in terms of biogas production. “I look forward to a good partnership and mutual benefit. BroGas feels like the right partner. I am confident that we will have a demonstration facility that attracts visitors, while BroGas simultaneously can streamline their biogas production and achieve better profitability. After conducting large-scale tests of a biogas plant in the southern part of Sweden, we have produced the first three industrial CEPT® platforms and it’s a big step forward for the company that we can now begin a collaboration with an additional reliable and professional partner”, says Pär Henriksson CEO Arc Aroma Pure AB. Arc Aroma Pure AB has conducted large-scale tests of a biogas plant in southern Sweden and found that the platform will lead to tangible improvements in efficiency while the technology enables new substrates which can be used for biogas production. Furthermore, the tests suggest that, in the future, the CEPT® platform, may replace the expensive and energy-consuming heat-based sanitation. “We want to be at the frontier in terms of biogas production and we believe in the basic technology CEPT® platform is based upon. Therefore, we have high hopes that the installation will lead to a clear increase in biogas production, says Magnus Ahlsten, Chairman BroGas. The companies’ collaboration will start in April and commissioning of CEPT® platform is planned for 2014. The evaluation phase is expected to be completed in autumn 2014. Arc Aroma Pure AB and Swedish Biogas International AB has signed an agreement to conduct full-scale tests of the AAP’s CEPT® platform industrially at one of SBI’s biogas plants. These facilities are located in Lidköping, Örebro, Västerås and Jordberga. A first project meeting took place in week 25. The CEPT® platform will be evaluated in operation for about nine months. The agreement means that SBI is given the opportunity to take over CEPT® platform and paves the way for the installation of additional CEPT® platforms within the SBI Group. The board of Arc Aroma Pure estimates that revenues for the company in connection with the current cooperation with SBI can be generated beginning in Q4 2014. With this agreement, the Arc Aroma Pure now reached the target to launch three pilot partnerships. The promotion will continue and be intensified. “Arc Aroma Pure has achieved several important goals with the SBI agreement. Furthermore, the Arc Aroma Pure has now established another important reference facility and simultanously made agreements and begun deployment of all CEPT® platforms in the zero series. Commissioning of the three CEPT® platforms gives us several important reference objects where biogas producers and other interested parties can see and evaluate the platform in an industrial operation. The three reference sites provide further opportunities for Arc Aroma Pure to collect data that could be important to attach and highlight in the marketing. 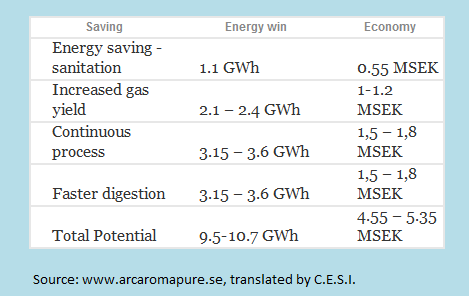 That is: Data that provide “proof” that our CEPT® leads to a significant increase in efficiency of biogas production”, says Pär Henriksson, President of Arc Aroma Pure AB . OptiFreeze AB has ordered equipment from Arc Aroma Pure AB for a total value of 894 000 SEK. The order includes two CEPT® generators, a lab CEPT® and a mini-CEPT®. In addition, the parties have signed an agreement under which Arc Aroma Pure will provide consulting services and materials to the Optifreeze planned pilot plant. The two ordered CEPT® generators, are simplified versions of the CEPT® generator used in the company’s pre-treatment container for biogas substrates. One of the generators is called lab-CEPT® and will be used in the laboratory for internal attempts at OptiFreeze. The second generator, entitled the mini-CEPT®, will be used in pilot experiments in food industrial environment. In addition to the order of two CEPT® generators, the companies have entered into an operating agreement that will further build value on the earlier collaboration. The agreement means that OptiFreeze purchases consulting hours and materials of Arc Aroma Pure AB needed for the the construction of the pilot plant in Eslöv. “Historically, the companies have had an extensive collaboration. The newly signed contracts concretize that collaboration. We consider OptiFreeze as an important customer, not least because of its potential, but also as an important partner and as an investment. Arc Aroma Pure is actively working on several fronts where biogas optimization is the main focus. We have very high hopes that our CEPT® technology will be well received in both biogas and water treatment area, but we also have prospective partners and customers in other application areas that we should explore and develop in the near future. The company faces a breakthrough“, says Pär Henriksson, President of Arc Aroma Pure AB. Arc Aroma Pure AB has sold CEPT® equipment to Klippan Municipality. The equipment is part of a pilot project run in conjunction with the municipality and Nordic Water AB. The purchase price amounts to 7 million, AAP co-finances the project with about 3 MILLION. Arc Aroma Pure AB has reached an important milestone with the sale of CEPT® equipment to Klippan Municipality. The equipment included in the pilot project previously announced, the purchase price amounts to SEK 7 million. As a project participant is co-financing the project with AAP about 3 MILLION. Other partners and funders in the pilot is Nordic Water AB and Klippan Municipality. The Swedish Energy Agency is supporting the project. “The purchase agreement is an important milestone in Arc Aroma Pure’s history and at the same time a great recognition of our technology. The project is located on the boundary between water treatment and biogas production, which is a huge market where our CEPT® technology has very good prospects. The wastewater treatment plants provides large amounts of sludge. This means great opportunities for our technology CEPT®, due to the fact that CEPT® processing has increased the capacity of the treatment plants and reduces the amount of residual sludge. Likewise, the amount of biogas produced will increase both in terms of yield and total amount“, said PO Rosenqvist, Chairman and Marketing Director at Arc Aroma Pure AB. Arc Aroma Pure AB (AAP) and Malmberg Water AB (MWAB) have signed a cooperation agreement which states that MWAB will market and sell BioCEPT® biogas operators in a number of markets around the world. The agreement has a sales value of 50 million per year and the volume is expected to increase over time. MWAB start their marketing efforts directly with the activities supported by the AAP in Sweden and abroad. MWAB currently has conducted nearly 100 plants for biogas upgrade in Europe and China. Biocept ™ is a natural supplement for MWABs catalog and marketing plan. The agreement also includes aftermarket and product development. “Malmberg Water is an impressive partner who has shown tremendous growth in the segment of biogas. I am confident that this agreement will make a clear imprint in our sales figures. We now have the opportunity to partner with a company that has a long history and driven by a strong environmental commitment, combined with strong capabilities in several interesting segments. MWAB have shown a great deal of knowledge, insight, and not least, a great deal of enthusiasm about the opportunity to market our Biocept ™, “said PO Rosenqvist, Chairman and Marketing Director at Arc Aroma Pure AB. “Now we can offer another innovative process solutions in water treatment and biogas, and it will be a great value to both our existing and future customers. Marketing of Biocept ™ is focused towards key customers and the signals we receive are positive. We are confident that CEPT® technology can contribute to a substantial optimization of biogas production and will be an important element in the construction of the energy neutral wastewater treatment plant”, says Per Johansson, Business Area Manager at Malmberg Water AB. Arc Aroma Pure AB (AAP) has teamed up with one of the world’s largest and most modern plants for the production of olive oil. A pilot based on CEPT® platform will be set up in the production plant in southern Spain. The agreement is a result of the experiments conducted in the laboratory, site visits and discussions held for over a year. Our Spanish distributor, Tasnord SL, has played a crucial part in the discussions and will be involved in the installation and the process in general. Arc Aroma Pure AB, Tasnord SL and the Spanish producer has signed an agreement to install a pilot plant in the producer’s state of the art manufacturing plant for olive oil, a plant which is also one of the largest in the world. The parties have agreed on the establishment and initial attempts at AAPS laboratory has been implemented. CEPT® platform has the potential to increase the amount of oil that can be extracted from the olives, CEPT® technology adds no heat, why olive oil volatile flavors are preserved and the quality is very high. AAPS and our partners hope that the method will increase the quality of the oil in general, but also that the method will increase the output share of the, higher market valued, extra virgin olive oil . Furthermore, it is likely that the CEPT® based process has the potential to accelerate the rate of production and that the technology is more cost effective than current production technology. The project is particularly interesting since the current production plant has a very high reputation and is considered as one of the industrys´best, resulting in many visits from industry colleagues. “This agreement is a natural step forward for Arc Aroma Pure. Now, we have mainly finished our product for the biogas market. Now, Arc Aroma Pure is proceeding according to plan and explores a whole new market segment, the extraction of olive oil. The CEPT® platform is the same, but the application and the market segment is brand new. If the pilot is successful, we have an important reference that will interest the rapidly growing olive oil industry and also a possible future customer, due to the fact that there are a number of production lines in the plant that can be upgraded. I would like to thank the representatives of Tasnord SL and employees for the focused work that enabled this agreement.” Says Pär Henriksson, President of Arc Aroma Pure AB. Arc Aroma Pure will make a rights issue of approximately SEK 17.3 million and has received subscription commitments and letters of intent of approximately SEK 10.6 million, representing approximately 61 percent of the issue amount. It appears from a statement. Arc Aroma Pure’s current working capital is sufficient for the current needs over the next twelve months, but a capital contribution makes it possible to further increase sales and marketing efforts and simultaneously explore new application areas and market segments. The subscription price is 25:50 per B share. Each share carries one warrant, and 11 warrants entitle the holder to subscribe for one new share. Arc Aroma Pure AB (publ.) is very active in the market and in different projects. We have chosen to release this memo to live up to our promise to be transparent and to keep our shareholders informed. Company bioCEPT® is now installed and commissioned at the biogas plant in Jordberga outside Trelleborg. The preliminary results are very promising and as expected. Our bioCEPT® in Jordberga will be an important demonstration facility now when we begin to receive both Swedish and foreign delegations, who expressed their interest to see the CEPT® plant in operation. The biogas plant in Jordberga is the largest and most modern plant for the production of biogas in Sweden. Now, the Patent Office has announced that bioCEPT® is a registered trademark. The registration is an important step in the company’s market strategy. Arc Aroma Pure representatives have visited prospective customers and partners in different market segments and in several countries. This includes visits to China, Thailand, India, Spain and the United States. We note that the hospitality is always very positive and that interest is also very large. Recently, the company installed a CEPT® generator, treatment chamber included, in one of the world’s leading facilities for oil production in southern Spain. The plant is probably the largest in the world and receives many visitors. The aim was to try CEPT® platform during full-scale production and to study how the technology can streamline the olive oil production. Both the management of the facility and isiting experts were initially skeptical, but after a few hours of operation, it was obvious to everyone that the technology works. Thus, we have verified that the effect demonstrated in the laboratory is scalable. Oil quality improved significantly and the amount of high-quality olive oil that can be extracted increases by more than 10% after a CEPT® treatment. We now have a good basis for further discussions with olive oil producers and actors in the industry, discussions operated jointly with our partners TasNord. Arc Aroma Pure AB, while visiting Bilbao, laid the foundation for a collaboration with AZTI Tecnalia, Spain’s leading research institutes in “marinating and food”, “in the context of Sustainable”. We will cooperate with the objective of developing equipment and methods based on CEPT® technology and to help prospective customers with evaluation and decision-making. “In this memo, my colleagues and I tried to summarize some of what is happening in the company. As everyone knows, we can not tell you everything, which would violate various rules and ethics. I can summarize that the tempo is high and that we work focused. We are in the middle of the process to move from research and development to marketing and production. A process if not entirely easy, but we are going. ” Says Pär Henriksson, MD, inventor and founder of Arc Aroma Pure. The author, Cutting Edge Science Invest, is an Arc Aroma Pure share holder. Cutting Edge Science Invest can not guarantee, or take into accountability, the content of truth and accuracy of the information in this article/post.Thus, Cutting Edge Science Invest requires that a possible reader gather complimentary information if any type of investment in the company described above is considered. Cutting Edge Science Invest provides personally biased information and at best also “general information and opinions”. The article/post does not contain professional investment advice. Thanks for leading my attention to AAP, have bought a batch of them and “put them in the drawer”! I feel quite confident that they will be a nice surprise with a horizon of a couple of years. I agree with a lot of what MedOrgChemist sees as potential block busters (SINT, Cybaero and Nexam).